Bangladesh’s Nobel laureate Muhammad Yunus today lost his final legal battle to remain as the chief of the micro-lending Grameen Bank he founded nearly three decades ago as the Supreme Court rejected his appeal against the sacking, capping his month-long dispute with authorities. The International Criminal Court has evidence Muammar Gaddafi’s government planned to put down protests by killing civilians before the uprising in Libya broke out, the ICC’s prosecutor said on today. Radioactive iodine in seawater near Japan’s crippled Fukushima nuclear plant tested five million times the legal limit, the facility’s operator said today, as authorities for the first time imposed radiation safety standards for fish in the tsunami-hit region. 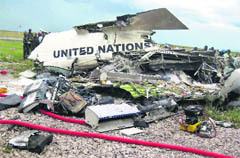 Only one person survived among the 33 UN personnel and crew members aboard a plane that crashed in Congo, UN officials said. 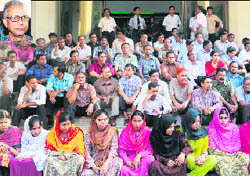 “Dismissed,” Chief Justice ABM Khairul Haque pronounced after the rejection of his appeal by a seven-member appellate division of the Supreme Court, which upheld an earlier high court verdict validating his sacking as Managing Director of Grameen Bank by the central Bangladesh Bank, during a four-hour hearing. Earlier on March 8, a two-member HC bench had rejected 70-year-old Yunus’ writ challenging his removal from the pioneering micro-lending agency that he founded in 1983. Yunus was not present at the apex court when it delivered the verdict while his Grameen Bank postponed a press briefing they called immediately after the judgment, sighting no reasons. But Grameen Bank lawyers said another petition filed by nine directors of the microfinance institution, who stood by Yunus, would come up for apex court’s consideration tomorrow though several legal experts feared it was unlikely to bring any different result. Bangladesh Bank, which is nominally independent from the government, fired Yunus on March 2 this year as it found that that his 2000 appointments as the microlending agency’s executive chief was faulty because the central bank’s mandatory approval was not obtained at that time. Yunus’ experiment of poor men’s banking earned Bangladesh the repute of being the home of micro-credit. He himself got the Nobel Peace Prize along with his Grameen Bank in 2006. The government has 25 per cent stake in Grameen Bank that employs 24,000 people and provides collateral-free loans to eight million borrowers. Analysts earlier said Yunus’ troubles stemmed from 2007 when he announced formation of a political party, an idea that did not please either Premier Sheikh Hasina or her archrival Khaleda Zia of BNP, while he himself abandoned it within months. But Yunus’ removal came as he apparently developed a growing dispute with the ruling Awami League in recent months after a Norwegian TV aired a documentary questioning the transaction of a Norwegian donor fund violating the agreement. Despite a green chit issued by Norwegian government relieving him of the allegations, the government formed a five-member “review committee” to examine Grameen Bank transactions, though his removal came ahead of the submission of the report by the investigators. Amid a massive international criticism of Yunus’ removal, the US last month warned that its relations with Bangladesh could be exposed to threats unless the Hasina government reached a compromise with the Nobel laureate. The peaceful protests that erupted on February 15 descended into civil war as Gaddafi’s forces first fired on demonstrators, then violently put down the uprisings that followed in the west, leaving the east and the third city of Misrata in rebel hands. NATO-led air power is now holding the balance in Libya, preventing Gaddafi’s forces overrunning the seven-week old revolt, but unable for now to hand the rebels outright victory. The United Nations Security Council, which on March 17 sanctioned air strikes on Libyan government forces to prevent them killing civilians, in February referred Libya to the ICC, the world’s first permanent war crimes court. Court prosecutor Luis Moreno-Ocampo is to report back to the UN on May 4, and is then expected to request arrest warrants. “We have evidence that after the Tunisia and Egypt conflicts, people in the (Gaddafi) regime were planning how to control demonstrations in Libya,” Moreno-Ocampo told Reuters in an interview. “The shootings of civilians was a pre-determined plan,” he said, adding the plan started to be developed in January. The court prosecutor wants to speak to former Libyan Foreign Minister Moussa Koussa who defected to Britain last week, saying he did so because of attacks on civilians by Gaddafi’s forces. Koussa’s defection would be taken into consideration in the investigation into Gaddafi, his sons and aides, Moreno-Ocampo said, hinting others inside the government might follow suit. “The fact that Moussa Koussa defected is interesting because that is one option you have. If you have no power to stop the crimes then you can defect to show you are not responsible,” he said. Fighting on the frontline in the eastern oil terminal town of Brega has become bogged down with Gaddafi’s advantage in tanks and artillery cancelled out by NATO-led air strikes which effectively back the rebels. UN peacekeeping chief Alain Le Roy told reporters he had no detailed information about the sole survivor, who he said was hospitalised after the crash in the Congolese city of Kinshasa yesterday. Le Roy said the cause of the crash had not been determined, but investigators were looking at the possibility that windy weather had caused the plane to miss the airstrip. The craft came down next to the air strip and broke up upon landing, he said. The UN peacekeeping mission in New York described the craft as a small passenger plane and said it was ferrying a mix of mostly UN personnel, including peacekeepers. Le Roy said the group was comprised of four crew members and 29 passengers who included a few workers for non-governmental organisations.